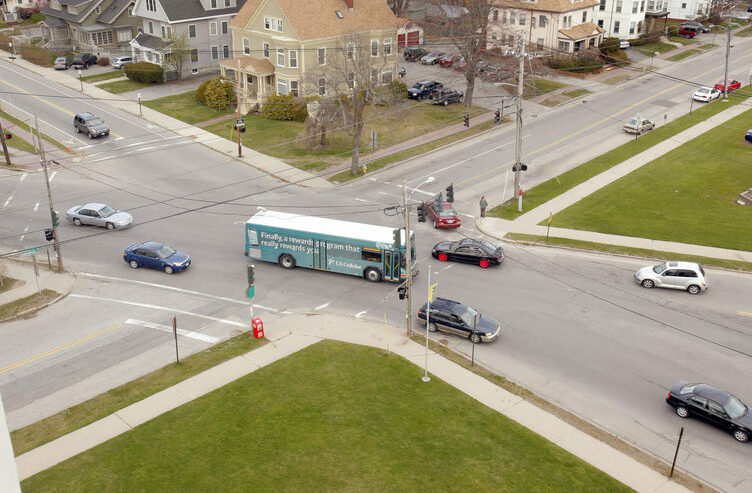 The artist and design won't be chosen before May, and construction of the roundabout at Deering and Brighton avenues is unlikely to begin before next spring, officials said Thursday. A new traffic roundabout to be built near the University of Southern Maine’s Portland campus will feature artwork installed on elevated green space, but who will design the piece and what it will look like will remain a mystery for a while longer. Members of the Portland Public Art Committee and a city planner hosted a meeting Thursday night to gather public input on the design. A half-dozen Portland residents turned out for the meeting. Several said their major concern is that the art not create a distraction and compromise pedestrian or vehicle safety at one of the city’s most heavily traveled and confusing intersections. The Maine Department of Transportation considers the intersection to be a high-crash location. An artist – the committee prefers that it be someone from Maine – and the design won’t be chosen until May or June at the earliest, according to Caitlin Cameron, an urban designer for the city of Portland. The city has budgeted $30,000 for the roundabout art, but Cameron said a total of $50,000 to $70,000 will probably be needed. The Portland Public Art Committee receives a small percentage of the city’s annual capital improvement budget to pay for public art approved by the City Council. The Maine Department of Transportation is still reviewing plans for the roundabout, which will be built at the intersection of Deering Avenue, Brighton Avenue and Falmouth Street, Cameron said. Construction of the roundabout, which will be funded by the city, probably won’t begin until Spring 2020 at the earliest, she said. In the meantime, the Public Art Committee must select someone to create a piece of art that will be seen by thousands of motorists over the next two decades. “The artwork potentially highlights this location as a gateway to Portland and the importance of the location as a site of learning both historically and currently,” the art committee said in a statement issued Thursday night. Portland resident George Rheault criticized the city’s most recent public art project, a so-called Luminous Arbor sculpture installed at the Woodfords Corner intersection. Rheault asked if it would be possible to move that piece from Woodfords Corner to the USM roundabout. “It looked much better as a concept, but it was much more diminutive. It lost a lot of its power,” Rheault said.